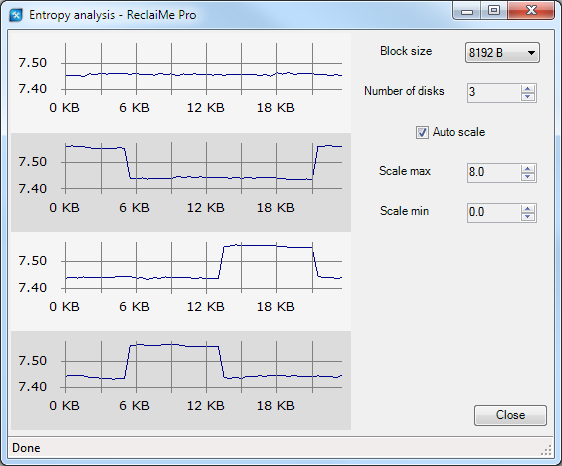 ReclaiMe Pro is unique in that it is the only data recovery software equipped with a built-in RAID analysis capability. Analysis of RAID content allows to get more information about RAID configuration that may significantly narrow the number of variants both for automatic and manual RAID recovery. ReclaiMe Pro analyzes content of array member disks to calculate the following RAID member disk characteristics: ratio of zero sectors, average disk entropy, mirror map, and parity tests. Content analysis of array member disks helps to separate disks which do not belong to the RAID in question. Also, this analysis helps to determine mirror pairs in the disk set. For example, a client gives you a 5-disk RAID and says that it is a RAID5. You launch content analysis over these disks in ReclaiMe Pro and see that one of the disks significantly differs in entropy and in zero sectors number making it obvious that this disk does not belong to the RAID (for example, it is a hotspare). You can find more information on the content analysis page. This type of RAID analysis is mainly applied for parity-based RAIDs such as RAID 5 and RAID6. Based on the visual representation of entropy over the RAID member disks in ReclaiMe Pro, you can easily determine the block size and the initial number of disks (whether missing or extra disk is involved). For more information, visit the entropy analysis page. In ReclaiMe Pro, the parity analysis provides a visual representation of the data consistency in terms of parity calculated over the analysed disk set. Sometimes, based on the content analysis, it seems that there are parity blocks on the analysed disk set, but the overall parity does not reach 100% or some other anomalies are revealed. 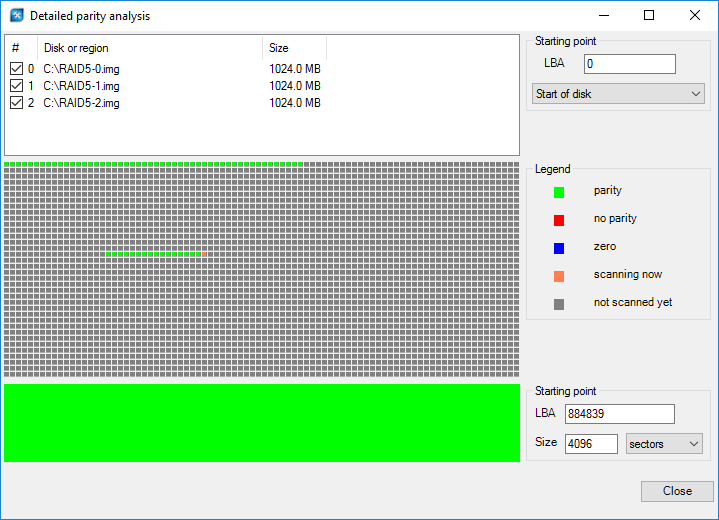 The parity analysis helps visualize parity distribution over the disk set. In order to calculate parity on the disks as fast as possible, the software doesn't read each sector, but it works with certain small number of sectors in each block instead. Once the quick scan is completed, ReclaiMe Pro returns to the sectors omitted at the first pass and calculates parity over them. Also, it is possible to get more the detailed calculation of parity for a particular area - you need to specify the start sector and the amount of sectors where you need to calculate parity. To select a disk area for the detailed calculation, you can simply click on the block you need on the map.